The first volume of Georg Graf’s (1875-1955) Geschichte der christlichen arabischen Literatur is still the most important reference work for Christian translations of the Bible into Arabic. Graf himself regarded as his lifework a comprehensive account of Christian Arabic literature, which eventually culminated in his magisterial five-volume Geschichte (Vatican, 1944-1953). Without doubt one of the greatest pioneers of the study of Arab Christianity, he also published on this and related topics in a great number of articles, monographs, and newspaper contributions and compiled catalogues of important collections. Especially the latter gave him direct access to ancient manuscripts in the Vatican, Jerusalem and Cairo. The question of availability of sources is crucial to contextualize Graf’s groundbreaking endeavours. 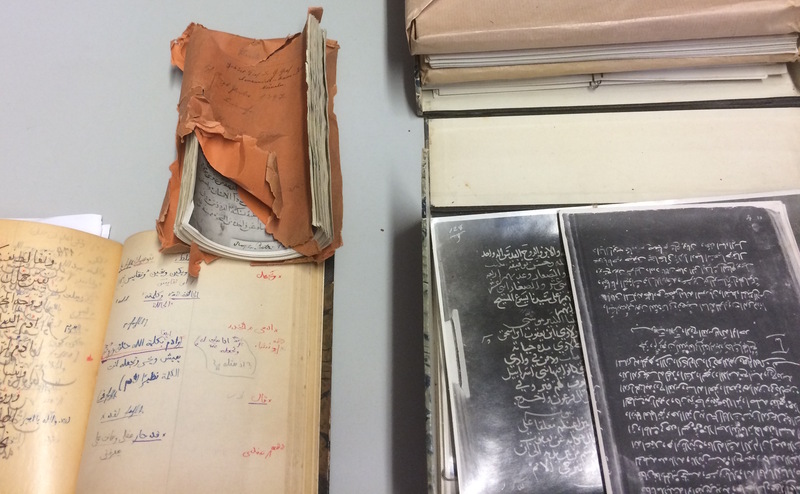 His Nachlass, the collection of documents he left behind, promises to yield important details. Graf’s Nachlass, today kept in Munich, holds the remainders of his extraordinary scholarly efforts, materials collected from 1900 till the end of his life. This treasure trove provides fascinating insights into his approach to the topics of his interest, but probably more importantly into the availability of primary sources, including the circulation of Christian Oriental manuscripts in Germany during the first half of the twentieth century. Graf’s Nachlass is currently split into two parts. After Graf’s death, his sisters left his materials and a number of books to Julius Aßfalg (1919-2001), one of Graf’s former protégés and later professor for Christian Oriental studies in Munich. I shall call this Nachlass A. Nachlass B (image 1 above), consisting of two boxes (mostly notebooks, manuscript photographs, letters and materials for publication) was sold to the Bavarian State Library in Munich shortly after Graf’s death. These materials are hitherto uncatalogued. Aßfalg did not pay any special interest to the contents of Nachlass A. Thus, after his death, it was about to be destined for the dumpster, if it had not been for Aßfalg’s student Hubert Kaufhold who recognised its value. Nachlass A consists of twenty cardboard drawers, further materials and a collection of letters, which have been inventoried by Kaufhold. He also used these materials for a number of publications. One should also mention 74 letters by Graf in the Nachlass of his penfriend, the librarian Emil Gratzl (1877-1957) kept at the Bavarian State Library. While the latter is catalogued, Nachlass A and B need to be properly catalogued, integrated into a publicly accessible library collection and, thus, put at the disposal of researchers. Yet, this is not an easy task as Graf worked on topics not only related to Arab Christianity, but to the whole of Oriental Christianity (including Armenian, Byzantine, Coptic, Georgian, Slavic, and Syriac sources) and used to make his notes almost entirely in shorthand. Much of the material found in Graf’s Nachlass went into his Geschichte. He also left a bundle of papers for a second edition of volume one, which he was unable to finish before his death. One of the greatest impediments for Graf’s project was the fact that he did not have direct access to the important collection of Christian Arabic manuscripts of St. Catherine’s monastery at Mount Sinai. 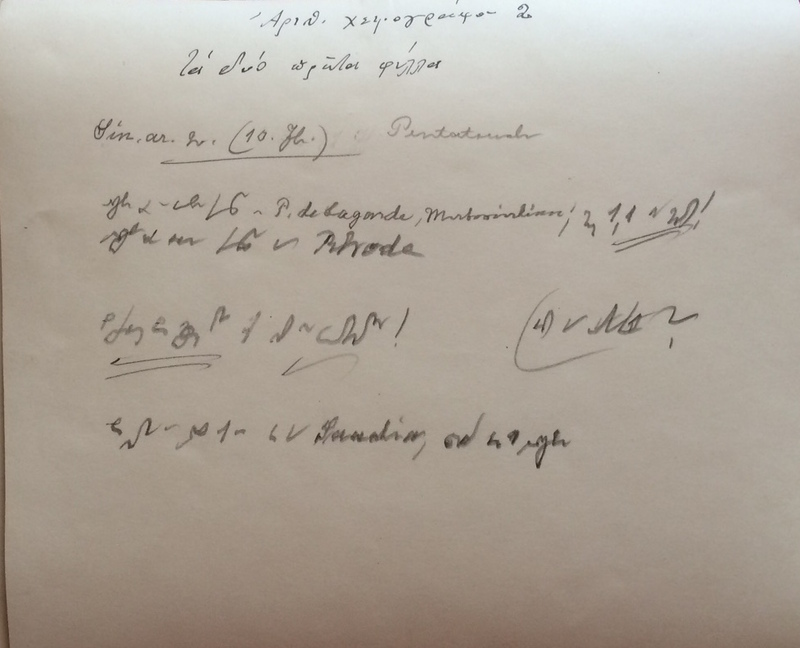 In a letter from 1954 (in Nachlass A), he laments that “since I could not consult any manuscript catalogue for my ‘Geschichte’ apart from that of Mrs. Gibson, the references I made relying thereon are problematic and, as it turns out now, partly incorrect” (my translation). Besides the Studia Sinaitica series, Graf’s knowledge of Sinaitic manuscripts was based on two further sources. A number of photographs in both parts of the Nachlass show that he seems to have been able to order copies directly from St. Catherine’s monastery. Nachlass A, for instance, contains photographs of MS Sinai Ar. 2, a translation of the Pentateuch including the Book of Daniel, dated 328 AH/ 939/40 CE (images 2–3 below). Graf was apparently unable to match it with one of his groups of Pentateuch translations, since he categorises it as “of uncertain provenance“ (Geschichte I, 108). Today, the Sinai monastery still holds glass plates from which photographs like those in Graf’s Nachlass were reproduced. 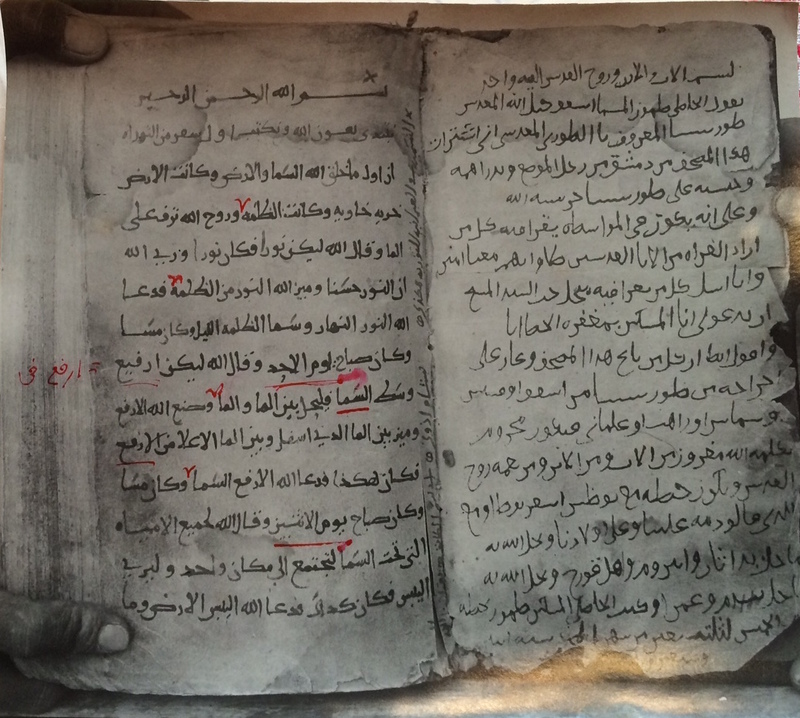 Apart from these, Graf got acquainted with Sinaitic manuscripts through collectors and antiquities dealers who sought out his expertise in order to determine the value of Christian Arabic manuscripts in their possession. Image 2: The original glass plate of MS Sinai, St. Catherine’s Monastery, Ar. 2, located at Sinai, from which Graf’s print (image 3) was produced. Photo courtesy St. Catherine’s Monastery. Image 3: Graf’s print of Sinai, Ar. 2, contained in Nachlass A. Photo courtesy Hubert Kaufhold. Image 4: Reverse of Graf’s print (image 3), with notes about the manuscript. Photo courtesy Hubert Kaufhold. 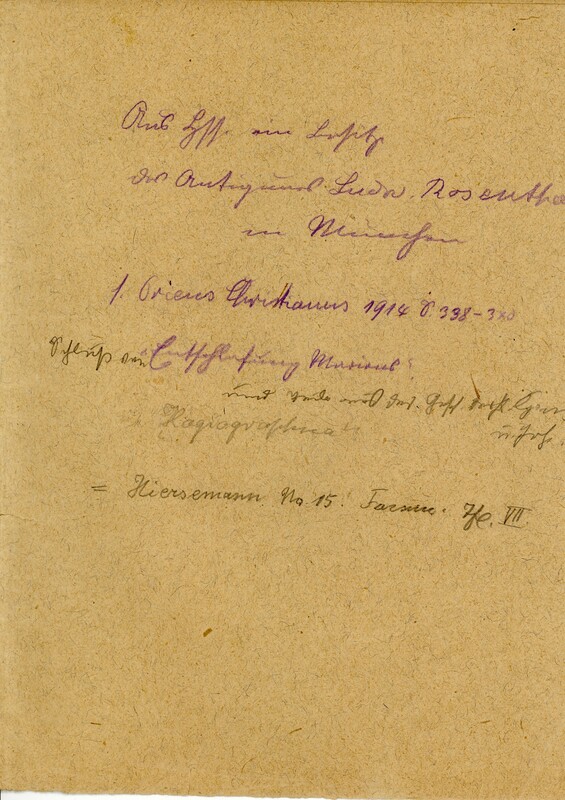 One example is a parchment codex bound in wooden boards, which was handed over to Graf by the Munich antiquarian Ludwig Rosenthal (1840-1928) around 1914. Graf’s photographs as well as his description made it easy for me to identify the manuscript as MS Bryn Mawr, Bryn Mawr College, BV 69. A little note (in Nachlass A; image 5 below) shows that he kept track, as it were, of its whereabouts, since Graf was able to identify a facsimile of the manuscript in the famous Katalog Hiersemann 500. Thus, the Nachlass here helps us to understand the circulation of this manuscript, which made its way from Munich to Leipzig, later to Zurich, New York and then to Philadelphia. Image 5: A note on MS Bryn Mawr, Bryn Mawr College, BV 69, identifying it with the entry in the Katalog Hiersemann 500. Photo by Peter Tarras, courtesy Hubert Kaufhold. Another example is Graf’s acquaintance with the erratic collector Friedrich Grote (1861-1921), whose life and collection of Oriental manuscripts I have researched for the last two years, bringing to my attention Graf’s Nachlassin the first place. Grote spent almost 30 years in Egypt and sought to base a scholarly career on his research, partly undertaken at St. Catherine’s monastery. This seems to have been pre-empted in some way by the simultaneous efforts of Agnes Smith Lewis and Margaret Dunlop Gibson, but probably to a greater extent by a lack of erudition in Oriental studies. When Grote returned to Germany in 1918, he brought with him a large number of Christian manuscript fragments in different languages. Frustration seems to have caused him to sell his collection, of which six Christian Arabic fragments ended up in the Bavarian State Library. In 1919, Grote sent these fragments together with two further fragments to Graf who immediately informed Gratzl about his suspicions that they had “very likely escaped the Sinai monastery” (my translation). Only in 1951, Graf learned from Grote’s widow, who provided him with a list of the whole collection, that the collector had been to the monastery himself. To Gratzl he wrote of his “great sorrow to see that the vandalistic dismemberment of the rich and precious manuscript collection of the Sinai monastery still continues” (my translation). Unfortunately, Graf was unable to convince the librarian to buy the whole collection, the remainders of which are scattered today throughout Europe and the United States. Graf’s Nachlass proves to be a valuable source for the history of modern research on Oriental, especially Arab, Christianity. 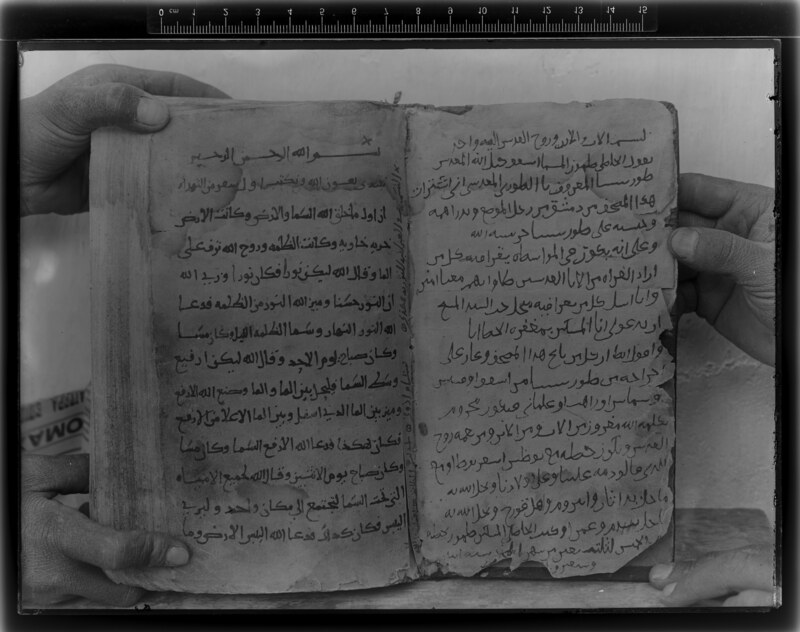 Furthermore, it helps us to better understand the acquisition and dissemination history of Christian Oriental manuscripts in Western institutions. It is hoped that these fascinating materials might at some point become available in digital form. Peter Tarras is currently a research assistant in the DFG-funded project “Korpus der arabisch-lateinischen Übersetzungen des 10.-14. Jahrhunderts“ and teaches philosophy at Julius-Maximilians-Universität Würzburg. He is writing a PhD thesis at the Munich School of Ancient Philosophy on conceptions of freedom and determinism in early Arabic philosophy (2nd/8th-4th/10th century) under the supervision of Prof. Peter Adamson. As an associated member of the Biblia Arabica project, he works on biblical quotations in Christian-Arabic apologetical literature, Bible commentaries, and the history of modern manuscript collections. On Graf’s publications see S.K. Samir, “Georg Graf (1875-1955), sa bibliographie et son rôle dans le renouveau des études arabes chrétiennes”, Oriens Christianus 84 (2000): 77-100. I am grateful to Dr. Helga Rebhan and Wolfgang Schmitt-Garibian who provided me access to these materials. These were purchased through Hermann Bojer before 1957, who knew Graf well and was head of the Oriental department of the Bavarian State Library until 1988. The contents of these drawers are described in G. Graf, Christlicher Orient und schwäbische Heimat: Kleine Schriften (Beiruter Texte und Studien 107a), vol. 1, ed. by Hubert Kaufhold, Würzburg: Ergon Verlag, 2005, XV-XVI. See also H. Kaufhold, Christlicher Orient und schwäbische Heimat: Leben und Werk von Prälat Professor Dr. theol. Dr. phil. Georg Graf (15. März 1875 – 18. September 1955): Katalog der Ausstellung im Rathaus Dillingen a. d. Donau anläßlich der Gedenkveranstaltung zum fünfzigsten Todestag Georg Grafs am 17. und 18. September 2005 in Dillingen, Würzburg: Ergon Verlag, 2005. I am likewise grateful to Prof. Kaufhold for not only providing me access to Graf’s Nachlass, but also with a great deal of information regarding its history. See H. Kaufhold, “Georg Grafs römische Kontakte”, in: P. Željko (ed. ), Between the Cross and the Crescent: Studies in Honour of Samir Khalil Samir, S.J., on the Occasion of His Eightieth Birthday (Orientalia Christiana Analecta 304), Rome: Pontifico Instituto Orientale, 2018, 709-21; idem, “Zur Geschichte der Sektion für die Kunde des christlichen Orients in der Görres-Gesellschaft”, Oriens Christianus 99 (2016), 221-42; idem, “Zur Geschichte der georgischen Studien in Deutschland”, Oriens Christianus 95 (2011 ), 175-212; idem, “Georg Graf – Schwäbische Heimat und Christlicher Orient”, Jahrbuch des Historischen Vereins Dillingen an der Donau 107 (2006), 63-88; idem, “Ein bisher unbekanntes Manuskript von Joseph Karst über Kirchen und Klöster in Georgien”, Oriens Christianus 88 (2004), 202-32; idem, “Georg Graf und die georgischen Studien (mit einem Exkurs über Franz Zorell), Oriens Christianus 86 (2002), 145-70. The shelf mark is Gratzliana G.
 M.D. Gibson, Catalogue of the Arabic Mss. in the Convent of S. Catharine on Mount Sinai (Studia Sinaitica 3), London: C.J. Clay and Sons, 1894. The corresponding glass plates were brought to the attention of the Biblia Arabica team by Father Justin during a stay at St. Catherine’s monastery in March 2018. Graf described the manuscript in G. Graf, “Alte christlich-arabische Fragmente”, Oriens Christianus 4 (1915): 338-41. Cf. K.W. Hiersemann, Katalog 500: Orientalische Manuskripte: Arabische, syrische, griechische, armenische, persische Handschriften des 7.-18. Jahrhunderts meist theologischen, vorzüglich kirchen- u. literaturgeschichtlichen Inhalts von hoher Bedeutung z. gr. Tl. Inedita und Unica, Leipzig: authors’ edition, 1922, 12 (n. 15); pl. VII. Cf. W. Strothmann, “Die orientalischen Handschriften der Sammlung Mettler (Katalog Hiersemann 500)”, Zeitschrift der Deutschen Morgenländischen Gesellschaft 3.1, Supplement: XIX. Deutscher Orientalistentag (1977): 285-93; 287; 293, n. 45. See also M. van Esbroeck, “Remembrement d’un manuscrit sinaïtique arabe de 950”, in: S.K. Samir (ed. ), Actes du premier congrès international d’études arabes chrétiennes (Goslar, septembre 1980) (Orientalia Christiana Analecta 218), Rome: Pontifical Institute of Oriental Studies, 1982, 135-47; J.W. Pollock, “Two Christian Arabic Manuscripts in the Bryn Mawr Library”, Journal of the American Oriental Society 110.2 (1990), 330-31. The results of this research are soon to appear as P. Tarras, “Friedrich Grote (1861-1921): A Collector of Oriental Manuscripts”. See G. Graf, “Christlich-arabische Handschriftenfragmente in der Bayerischen Staatsbibliothek”, Oriens Christianus 38 (1954): 125-32. Übersetzung in Zeiten der Digitalisierung – Warum braucht man immer noch einen Profi? Vatican, codex Barb.or. 2, which contains the Psalms of David in five languages: Ethiopic, Syriac, Coptic, Arabic, and Armenian. Ca. 14th century CE. El Génesis apócrifo, uno de los rollos del Mar Muerto. Codex Sinaiticus : la Biblia más antigua. आपको है मालूम ये दुनिया की सबसे प्राचीन भाषा ?